Following its success to mount a first, historic toy convention in Bulacan, the Malolos Toys and Hobbies Convention (MALCON) will be having a three-day kickoff or launching event on February 15-17, 2019 at the heart of the municipality of Pulilan, SM Center Pulilan. MALCON is one of the Philippines’ largest toys and hobbies event located at Bulacan’s capital city, Malolos City. In 2018, the historic MALCON 2018 has acquired a record-breaking 6,000 attendees in two days filling the entire Malolos Sports and Convention Center. The first MALCON officially titled “MALCON 2018: The 1st Malolos Toys and Hobbies Convention,” which was held last May 26-27, 2018, was a feast and gathering of toy enthusiasts, entertainment and gaming aficionados, cosplayers, collectors and hobbyists. The MALCON concept was inspired by various pop culture conventions across the nation and the globe. The at-first ambitious attempt to gather toy and hobby communities was a product of the imagination of Malolos City Mayor Christian Natividad, who also help the funding in mounting this very big project in Central Luzon. 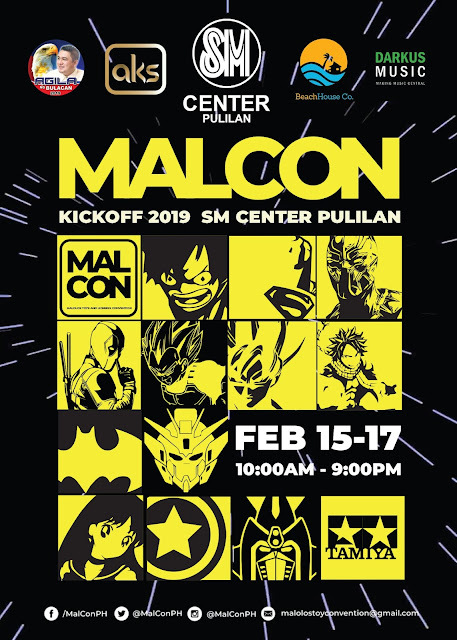 This year, on its second year, MALCON will be having two events namely: MALCON KICKOFF 2019 (SM Center Pulilan – Feb. 15-17, 2019 10AM-9PM) and MALCON 2019: THE 2ND MALOLOS TOYS AND HOBBIES CONVENTION (Malolos Sports and Convention Center – April 2019 –official date to be announced). The February event will serve as the opening salvo and teaser event for the main event in April. There will also be a press conference on February 16, 2019 at 1:00pm at the Mall atrium stage. The presscon’s speakers will be Malolos City Mayor Christian D. Natividad and MALCON core organizers namely: Ramon Christopher De Mesa, Thetay Enriquez, Ann Mercado Solano, Kimshin Solano, Jap Enriquez, Rei Cortes, Jaypee Ignacio, and Jerome Villanueva. The presscon is aimed to discuss and reveal details of the upcoming MALCON. During the Pulilan event, there will be various toy exhibits featuring anime heroes as well as Japanese and Western icons. The Pulilan event will also showcase Tamiya displays and remote control car exhibits as well as Tamiya tournament and remote control car exhibitions and tutorials. Bulacan-based artists will also exhibit their skills in drawing anime and cartoons in the event. Music artists and indie bands will also showcase their astounding music on this kickoff event. Event spectators should also watch out for surprises, games, and other exciting activities. This is really an exciting post-Valentine treat to single and lovers alike. Interested Bulakenyos and toy enthusiasts can bring their families and friends and enjoy this one-of-a-kind experience. MALCON KICKOFF 2019 is made possible by AKS, BeachHouse x Darkus Music, Hon. Mayor Christian D. Natividad and SM Center Pulilan. Free admission! No fees, just pure fantastic geekery! 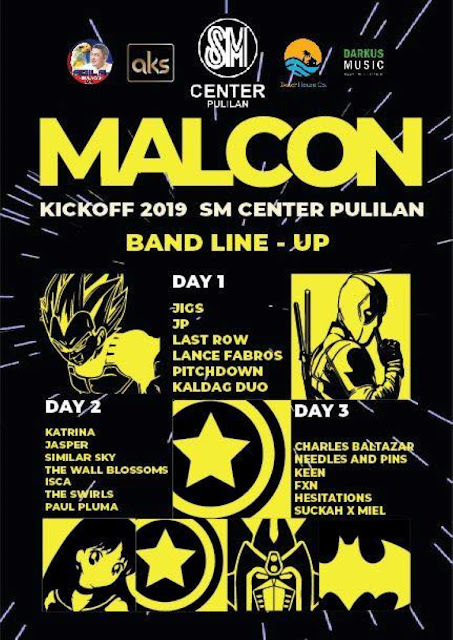 Let’s rush to MalCon KickOff 2019! Invite your friends, families, special someone or your entire barangay! For more updates, like us on Facebook at fb.com/MalConPH or visit SM Center Pulilan and see posters and print ads for details. You may also follow us on Twitter and Instagram at @MalConPH. What do you think of this event? OtakuPlay will be one of the media partner covering the event as part of Red Cloud Interactive.